Army’s angling for a big finish to its three-year slate of games at Yankee Stadium — a return match with Notre Dame. 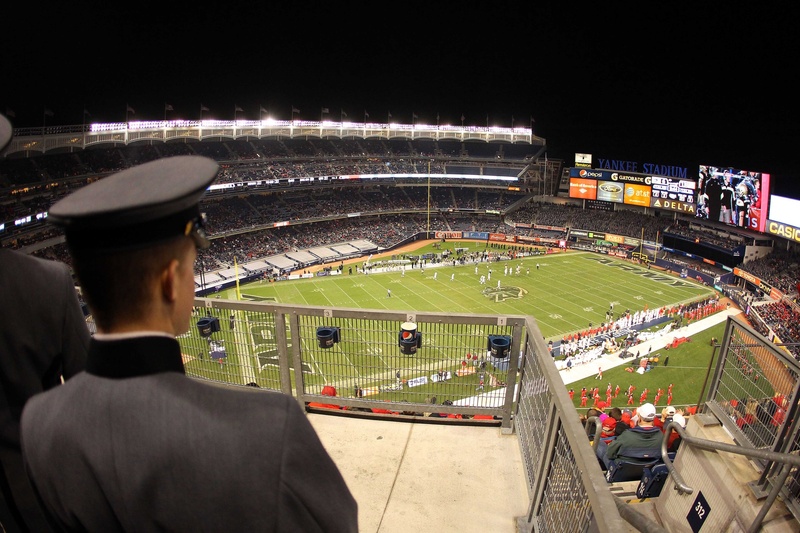 The Black Knights are booked to face Connecticut in the Bronx in 2014, then Rutgers in 2015 — a rematch of their 2011 Yankee Stadium showdown — according to Army football guru Sal Interdonato’s latest report. But the capper in 2016 is still in doubt — Army athletic director Boo Corrigan told Interdonato that talks with Notre Dame are in the works, but nothing’s been locked in. The Irish downed Army 27-3 on Nov. 12, 2011, in the first college football game ever played at the new Yankee Stadium, which opened in 2009. The teams met in the old park several times, including in 1946’s “Game of the Century.” Notre Dame went 14-5-3 against the Black Knights at the old Yankee Stadium, according to this Notre Dame news release. Corrigan also said the Black Knights have had no problem filling their future schedules — a concern brought on by college football’s ever-expanding conferences, which could limit teams’ out-of-conference slate and give the independent Black Knights fewer options for opponents. Keep track of all the future-opponent news here at After Action, as well as with our good friends at FBSchedules.com.